I used to have mixed feelings about Christmas trees. On the one hand, I felt that in an increasingly deforested world, it wasn’t right to grow plantations of trees only to cut them down for a few weeks of decorations. On the other hand, having an adorned tree in your living room with gifts underneath is a very happy thing to behold. 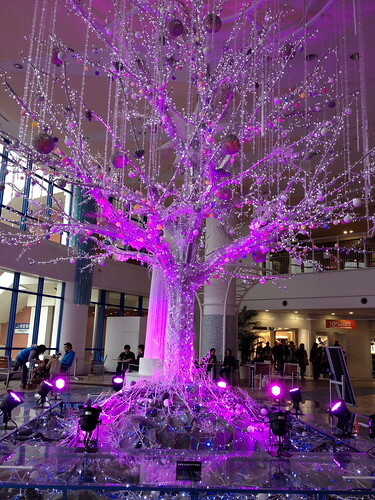 The solution for most is to either have a plastic tree, which is problematic unto itself, or have a live potted tree, a fantastic idea. Or as I like to do, just go and visit all the Christmas trees around town. 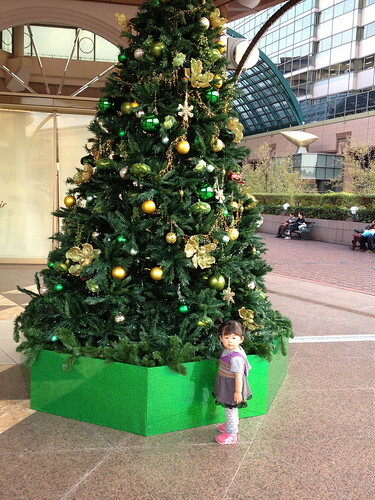 There are plenty of the traditional pine and fir Christmas trees. Moka loves them and this one is her favorite. She runs up to it every time we pass by and yanks at the ornaments. These next two are made of everyday objects. 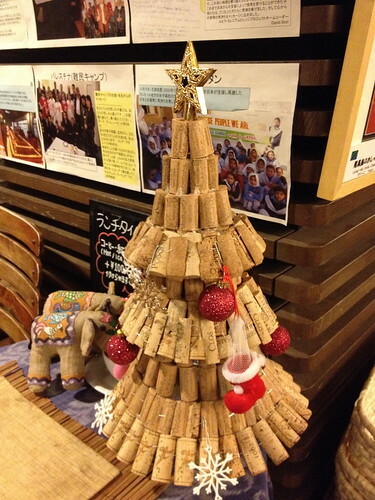 One is made of magazines and newspapers and the other is made of cork. 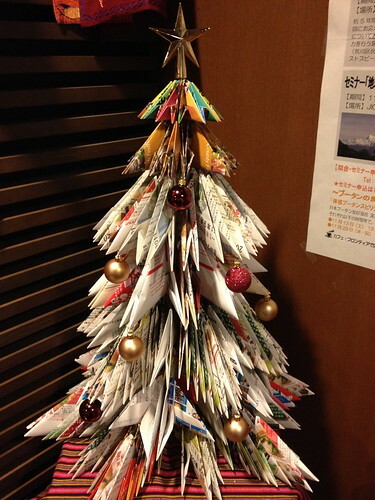 There should be a movement to make Christmas trees out of recycled materials, like CDs, rags and euro bills. 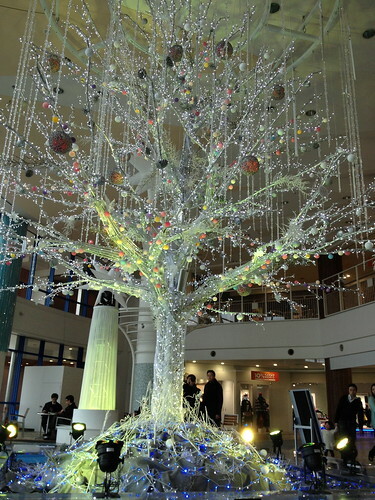 My personal favorite was a brilliantly lit tree in Aqua City, an indoor mall by Tokyo Bay. The colors constantly changed and at regular intervals there was a light show accompanied by a lot of dramatic music. A little over the top but magical. 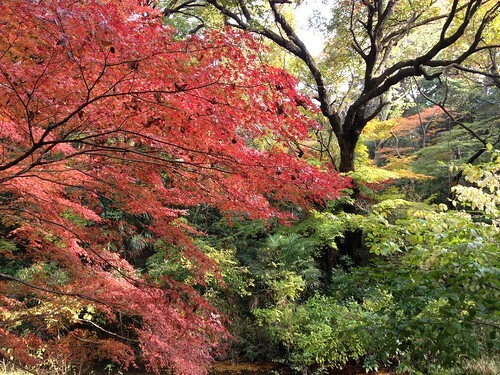 But nothing beats the trees, alive and festive, in nature itself. 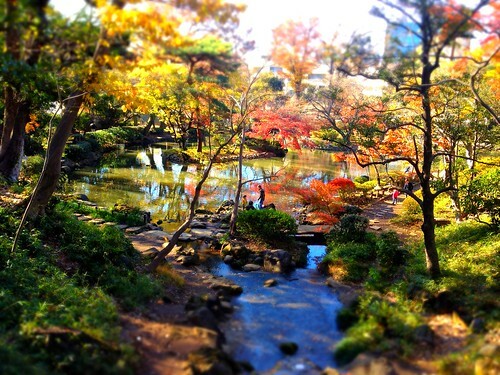 Usually, the leaves change colors in late November here in Tokyo, but this year was very late. The colors have been peaking in the last week or so just in time for Christmas. May your Christmas and the New Year be equally colorful and vibrant. absolutely stunning! They are gorgeous. I haven’t heard from you for awhile, Wind, wish you and your lovely family a very vey Happy and cheerful New Year! this is a very very late reply but i’ve been out of blogging for a while. thank you and hope you had a great new year for the past two years! I love trees in nature. The ones you’ve shown from your neck of the woods are so elegant. 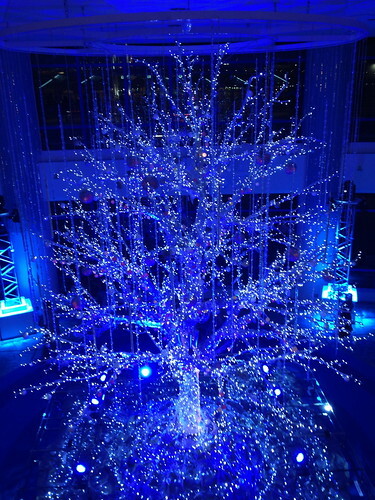 I mostly have balsam firs in my yard (the type also grown on Christmas tree farms in Nova Scotia) and I love to see them adorned with fresh, sparkling snow, but that Aqua City tree is just so stunning and magical.